January Cupcake of the Month - Superbowl Cupcakes ~ Learn, Live, and Explore! 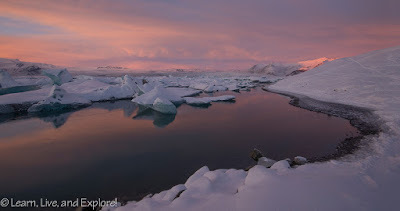 Next weekend is the big Superbowl game, and while I'm not a huge football fan, I do embrace the spirit of the day and enjoy all of the smörgåsbord of food and desserts that accompany it. 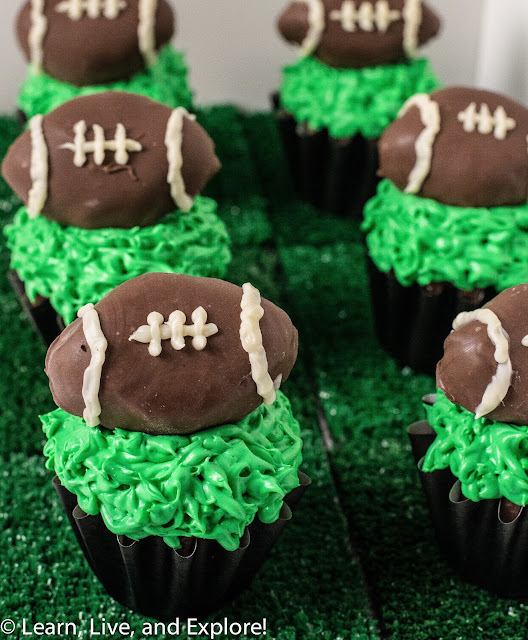 So to give you an idea of something to consider bringing to the Superbowl party you're planning to attend, here's a football-themed cupcake of the month, inspired by Hello Cupcake. 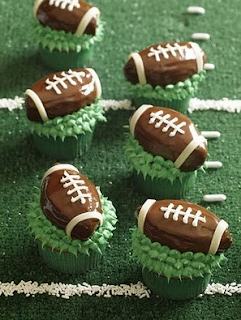 The football truffles are made by taking 1 package of Oreo cookies, putting them in a food processor until they are completely crushed, then adding 1 8oz. package of softened cream cheese to the crumbs and pulsing until it forms a dough. With the dough, you can start by forming a ball (1/2-1 inch depending on the size of football you want) then pressing down and shaping the dough into a football shape. Freeze for at least 30 minutes. To do the outside, I melted 1 bag of Wilton Light Cocoa Candy Melts, dunked the footballs in the melted chocolate, then let them drip dry on a rack. For the laces, I used Wilton White Candy Melts that I melted in the microwave inside a disposable piping bag. I should have used a tip on the bag to make neater lines, but I opted for the simplicity of just snipping off the end. The cupcakes are a box mix and the frosting is from a prepared can mixed with green food coloring gel. Super easy!